India: Traditionally, the strength of its air force has been increasing with fighter aircraft bought from Russia (MiG-27, MiG-27, MiG-35). But now India has made a deal to buy the modern Raphael aircraft built in France by changing this practice. In order to strengthen its air force, India had issued tenders for multirole new combat aircraft in 2007, including the US F-16, FA-18, Russia's MiG-35, Sweden's Gripen, French Rafael, and European Group The Eurofighter Typhoon had offered the claim. On April 27, 2011, in the last race of the tests, Eurofighter and Rafael were found to be favorable to Indian conditions and, finally, on January 31, 2012, due to the best bid and field trials, the tender Rafael was given the best results of Indian conditions and standards. Rafale Fighter Aircraft is a multirole fighter aircraft that makes the company Desmond Aviation of France. 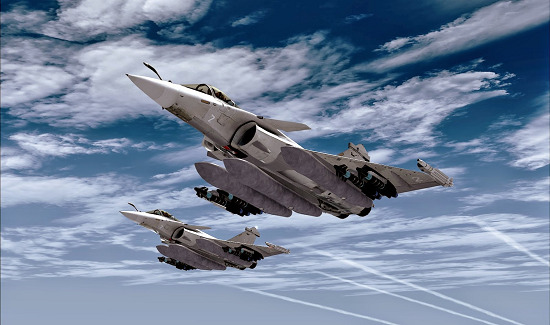 The first aircraft of the Rafale-A class took off on July 4, 1986, while the Rafale-C class took flight on May 19, 1991. From 1986 to 2018, 165 units of this aircraft have been built. Raffel A, B, C and M categories are available in one seat and double seat and double engine. Raphael; Air by air, with an air attack on the ground, being capable of attacking atom, can fly air missiles in the air by flying at very low altitude. Not only this, the aircraft has an oxygen generation system and does not need to be filled with liquid oxygen. This aircraft searches for the position of the enemy in Real Time by making 3D mapping with an electronic scanning radar.